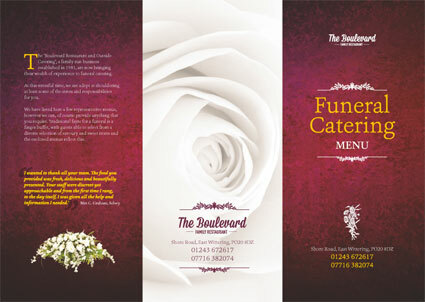 The ‘Boulevard Restaurant and Outside Catering’, a family run business established in 1981, are now bringing their wealth of experience to funeral catering. At this stressful time, we are adept at shouldering at least some of the stress and responsibilities for you. We have listed here a few representative menus, however we can, of course provide anything that you require. Traditional fayre for a funeral is a finger buffet, with guests able to select from a diverse selection of savoury and sweet items and the enclosed menus reflect this. To download our leaflet please follow the link below which will open a PDF. I wanted to thank all your team. The food you provided was fresh, delicious and beautifully presented. Your staff were discreet yet approachable and from the first time I rang, to the day itself, I was given all the help and information I needed. The prices quoted for the following finger buffets include table coverings for your buffet table, crockery, condiments and serviettes in a colour of your choice. It also includes delivery of all of the aforementioned to your venue and the collection of the used items on completion. We can supply all the facilities to provide tea, coffee and soft drinks (fruit juice, mineral water and cordials) as required. We can supply alcoholic beverages with the appropriate glassware on a sale or return basis. For a modest fee staff can be provided to dispense drinks and food whilst generally tidying and ensuring the smooth running of the event. Selection of sandwiches on white and brown bread. Wide choice of fillings e.g. egg & cress, cheese & coleslaw, smoked salmon & cream cheese, ham… or varieties of your choice. If you would like to discuss your catering requirements with us, please do not hesitate to get in touch. Fantastic service. The best fillet “melted in the mouth.” All round favourite and a must when eating in the village. Seriously good food and value for money. Four adults and two children had lovely meal in this friendly diner. Portions were enormous, and the staff allowed slight variations. Service was swift and the prices very reasonable. It is plain to see why The Boulevard is so popular. The next time we visit East Wittering from Staines Middlesex this will be our lunch date. Extensive menu with substantial portions and reasonably priced. It says a lot about a restaurant when others on the same street are deserted and this one is heaving with customers. Friendly service, and the food has a real home-cooked feel about it. I would just say that the veggies could do with a little more flavouring – but I suppose you could just add salt at the table. We visited a couple of times last September while on holiday and now, returned in June and it definitely lived up to expectations. Ignore the odd reviewer who leaves negative comments but has only ever left 1 or 2 reviews in their TripAdvisor life 😉 Listen to the regulars! The Boulevard has had a makeover but it’s still run by the same friendly people. East Wittering on a cold March day can be definitely bleak but open the door into this bright and welcoming place and life looks better! A wide selection of meals on the menu and daily specials will give even the pickiest person plenty to choose from. But it’s the quality and the quantity of the food that set the Boulevard way above anything for miles around. Fresh vegetables, good quality meat and all cooked just right. However the thing that absolutely clinches it, are the prices. Quite how these are kept so low remains a mystery but maybe most other eating places are just greedy with their profit margins! I have been visiting Wittering for over 30 years now and The Boulevard seems to have always been there. I don’t holiday there any more but occasionally will take a trip down with friends on the bikes for breakfast. It is always reliable, good portions and served with a pleasant smile. The breakfasts aren’t pretentious, no artichokes, rocket or ostrich eggs, just real plain tasty food. We were with another couple and the total bill was £43 for breakfast, numerous coffees and two hours of catching up with old friends in the sunshine. There is a car park in Marine Drive just a few minutes walk away. After a walk from East to West Wittering with friends, this was a great place to enjoy breakfast. The service was excellent as we all ordered something different. The food was really good, generous portions and well cooked, delivered promptly, even though it was busy. We will be returning soon. Really popular and deservedly so…. I’ve been coming here for more years than I care to recall. The food is excellent and great value for money. In summer it can be very busy but it’s worth waiting for. Great place for really excellent food at a very reasonable price. This place is a real gem and has very friendly staff. Definitely recommend the crab starter, steak pie, matured steak, tomato and basil soup, treacle sponge and lemon meringue. Enjoy.